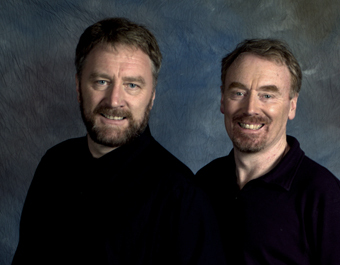 Brothers Michael and Shay Black play an exciting mix of Dublin street songs, music hall songs, and historical ballads, as well as songs from the Irish, English, and Scottish traditions and the occasional contemporary number. Singing in close harmony, playing guitar, banjo, and keyboards, telling funny stories, and even dancing now and again, Michael and Shay draw people in with their energy, wit, and superb musicianship. They have a special fondness for songs that inspire the audience to sing along with the chorus, like “Down Our Street” and “The Great Storm Is Over.” Joining the brothers tonight are Bobbi Nikles on fiddle, Eamonn Flynn on piano, and special guests.